Frequently Anthony Watts (owner of the blog WUWT) copies and pastes a press release about a new scientific paper so his readers can have something new to mock. He usually starts his headline with the word "Claim", just so his followers know they aren't supposed to "believe" science. Many of his followers aren't too bright and they need these clues so they can tell how to respond. From the University of Edinburgh and the department of soda pop science, comes something we already knew. I wonder who approved the grant for this one? Diatoms have a silica wall (known as a fructule). As the abstract says, CO2 uptake by diatoms may be limited by how much silica is available to them. Incidentally, I found a lovely web page on diatoms, with pictures and very clear descriptions. They tracked the abundance of the key elements silicon and iron in the fossils of tiny marine organisms, known as plankton, in the sediment core. Plankton absorb CO2 from the atmosphere at the ocean surface, and can lock away vast quantities of carbon. Researchers found that those periods when silicon was least abundant in ocean waters corresponded with relatively warm climates, low levels of atmospheric iron, and reduced CO2 uptake by the oceans' plankton. Scientists had suspected that iron might have a role in enabling plankton to absorb CO2. However, this latest study shows that a lack of iron at the ocean surface can limit the effect of other key elements in helping plankton take up carbon. This effect is magnified in the southern ocean and equatorial Pacific and coastal areas, which are known to play a crucial role in influencing levels of CO2 in the global atmosphere. 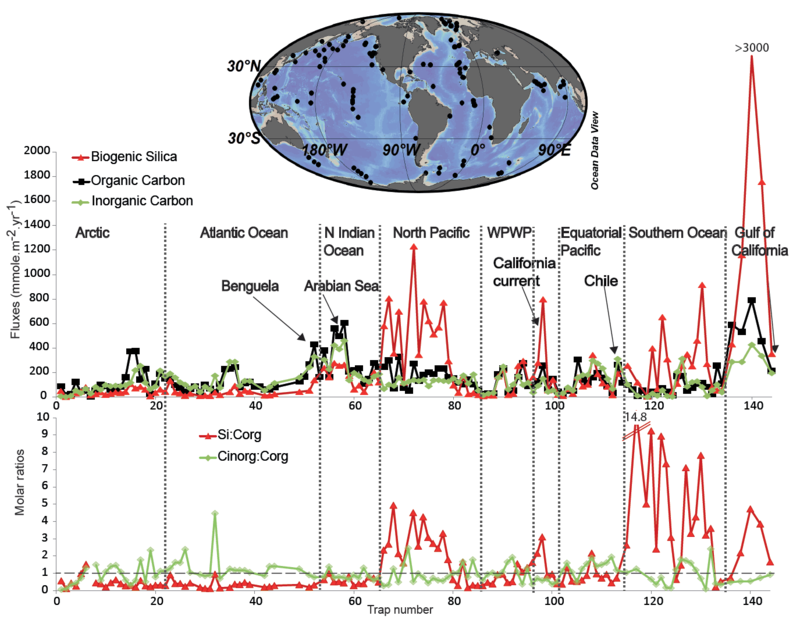 The interactions between humans, carbon dioxide, climate and dust are shown schematically in Figure 17, and highlight that there is a potential positive feedback loop between higher carbon dioxide, reducing desert dust area, reducing iron deposition to the oceans (which could contribute to lower ocean productivity), lower carbon dioxide uptake by the oceans, and thus higher carbon dioxide concentrations. In addition, ocean productivity may cause the emission of other greenhouse gases (e.g., methane or nitrous oxide) or aerosols (sulfate or organic), thereby complicating this feedback (e.g., Jickells et al. 2005). Figure 17. 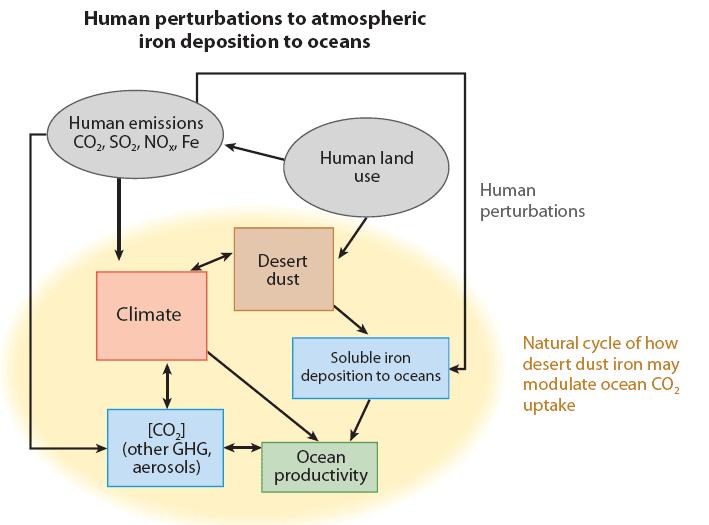 Schematic representing feedbacks between the natural ocean carbon cycle, carbon dioxide concentrations, and iron inputs; also shows how humans could be perturbing the iron deposition to the oceans. Researchers from the University of Edinburgh say their findings are the first to pinpoint the complex link between iron and other key marine elements involved in regulating atmospheric CO2 by the oceans. Their findings were verified with a global calculation for all oceans. The study, published in Nature Geoscience, was supported by Scottish Alliance for Geoscience Environment Society and the Natural Environment Research Council. Dr Laetitia Pichevin, of the University of Edinburgh's School of GeoSciences, who led the study, said: "Iron is known to be a key nutrient for plankton, but we were surprised by the many ways in which iron affects the CO2 given off by the oceans. If warming climates lower iron levels at the sea surface, as occurred in the past, this is bad news for the environment." Here is a diagram from the supplementary paper, showing the biogenic fluxes recorded in 140 sediment traps around the world - biogenic silica, organic carbon and inorganic carbon. As always, click to enlarge. Figure S1: Ocean-wide compilation of normalised biogenic fluxes recorded in 140 sediment traps deployed within the framework of the US JGOFS endeavour (Thunell 1998a; Ragueneau, Treguer et al. 2000; Honjo, Steven et al. 2008 and references therein). The Gulf of California results correspond to mass fluxes recorded in the same sediment trap at different times during the 7-year record period: summer, winter, El Nino, maximum upwelling conditions and El Niño conditions. The position of the sediment traps is shown on the map (top). Biogenic fluxes (middle) and molar ratios of the fluxes (bottom) are shown for each region considered. WPWP stands for Western Pacific Warm Pool. The fluxes have all been corrected for water depth (Honjo, Steven et al. 2008). Is there anything in this that isn’t already well known? Well maybe: “Their findings were verified with a global calculation for all oceans”, that’s pretty impressive based on a single drill core that doesn’t even span a whole glacial cycle. If warming increases the ease of CO2 release from the oceans what does that do to the “Acidification” meme? Thing is, as I understand it, that the oceans will still acidify because that's more to do with dissolved CO2. Whereas this paper is about the CO2 that's taken up by diatoms. If anything, with more CO2 in the atmosphere the partial pressure would increase and so oceans would get even more acidic. I'm speculating here, so feel free to add your two bobs worth. Has this research been cleared with The Team? Because it indicates that a considerable amount of CO2 has been released from the oceans naturally by the slight warming in the last century. It also means that Trenberth’s missing heat announce itself by a release of CO2 from the deep oceans. CO2 causes ‘ocean acidification’ = BAD! CO2 causes a ‘warmer atmosphere’ which causes oceans to out-gas CO2 = BAD! Now they’ve looked at one core they will need to study 1,000s more to verify the findings, that will take years, (a lifetimes worth…. with lots of field trips) ALL grant funded !! Your “comes something we already knew” isn’t really fair. This research does not make the direct link between temperature and Henry’s constant which you allude to in your “soda-pop” sneer. It does present an indirect effect of warming oceans on biological CO2 sequestration. But like all studies of this nature they fail to run a laboratory experiment to test the hypothesis under controlled conditions. It supports the idea that atmospheric CO2 increases are an EFFECT of warming, not a cause. First the last XKCD comic and now this paper. Are people becoming dumber? Hey, maybe it is another effect of rising CO2 levels. Because solubility of permanent gases usually decreases with increasing temperature at around the room temperature, the partial pressure a given gas concentration has in liquid must increase. While heating water (saturated with nitrogen) from 25 to 95 °C, the solubility will decrease to about 43% of its initial value. This can be verified when heating water in a pot; small bubbles evolve and rise long before the water reaches boiling temperature. Similarly, carbon dioxide from a carbonated drink escapes much faster when the drink is not cooled because the required partial pressure of CO2 to achieve the same solubility increases in higher temperatures. Partial pressure of CO2 in the gas phase in equilibrium with seawater doubles with every 16 K increase in temperature. It is 1800s Physics, for Pete’s shake. Thinking about it, desert dust is probably bad news either way. Hotter, drier stormier = more atmospheric desert dust -> more iron in the oceans. However this study suggests lower iron which would mean Warmer,damper, less stormy = less atmospheric desert dust -> less iron in the oceans. Gosh almighty! Does that mean CO2 is released by oceans as the temperature increases!? Well there’s a lot of ocean out there. I’m beginning to wonder if it’s really me that’s responsible for all this planetary destruction. What shall we do? Why don’t we call upon the governments of the world, the UN and the quangos to cover up the oceans with aluminium foil and save the planet from warming? Thank you for explaining why “ocean acidification” is not possible…. CO2 and other gases. As oceans become more saturated, their ability to absorb more CO2 slows depending on pressure and temperature of both atmosphere and ocean. until complete saturation point is reached - we are long way from that.. So, yes, ocean acidification continues in concert with changing equilibrium state with atmospheric concentration of CO2. @vitaminccs: Surely "As misunderstood on WUWT" or "As denied on WUWT"? What the WUWT crowd misunderstand is that CO2 does not behave like a lot of gases when it is absorbed by the ocean. For the comprehensive details see Zeebe and Wolf-Gladrow's "CO2 in Seawater" book. Gases such as Nitrogen obey Henry's Law. Carbon dioxide behaves differently. A lot of CO2 dissolved in the ocean reacts with water to form carbonic acid which dissociates to bicarbonate ions which dissociates to form carbonate ions. These equillibrium reactions are temperature and pH dependent. The surface and deep oceans are not well-mixed, which means that rapid accumulation of CO2 in the surface ocean leads to increased pH and inhibits the formation of carbonates. Partial pressures work both ways. You mean decreased pH (or increased acidity)?